In common usage, the term ‘survey’ refers to a drawing of a parcel of real property. This drawing depicts the results of the surveyor’s measurements made in the field and his or her interpretation of evidence relating to the location of the boundaries of the property based on a legal description furnished to the existence, the identity, the location and the dimension or size of natural or artificial features on land or visualization if needed, of such documentation. There are numerous types of surveys. The most commonly encountered type is the boundary survey, which determines the perimeters of a parcel or tract of land by establishing or re-establishing corners, monuments and boundary lines for the purposes of describing the parcel, locating fixed improvements on the parcel, dividing the parcel or platting. Surveys are a part of nearly all modern real estate transactions. Many institutional lenders require a survey as a condition before making a loan secured by a mortgage encumbering real estate. An accurate survey, coupled with a physical inspection of the property, is by far the best way to determine the location of the boundaries of the property and the location of improvements on the property. It will also show whether the location of the property on the ground is the same as the written legal description. The survey also adds value to your transactions by providing an additional level of protection coverable through title insurance. Most real estate transactions in the United States are covered by title insurance because of the protections it provides. A current survey provides information that will allow a title insurance company to delete the exception for matters of survey in the title insurance policy, such as boundary lines, encroachments and parcel area. A wise buyer will always obtain a survey to be certain that, among other things, the property is in fact located where the buyer thinks it is located. Nothing is more frustrating than discovering that the fence line is NOT the true property line, and your buyers just ‘lost’ twenty feet of property to their new neighbor. A seller will generally be less concerned about a survey than will a buyer, unless the survey reveals problems or defects which the seller is obligated to remedy or unless the purchase price is based on the quantity of property (normally in terms of acreage or square feet) as determined by a survey. What is survey coverage and why do you need it? 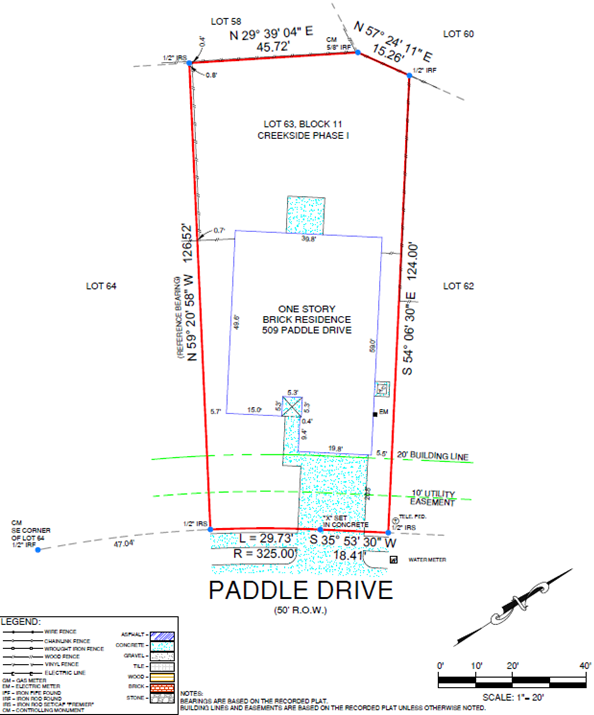 Encroachment of improvements into easements or building setback lines. A Buyer who does not obtain a new survey but relies on a previous survey would be well advised to purchase this coverage. What if you have an existing survey? Utility company installation of new or updated transmission lines may result in changes to the existing easement, which may not be shown on an older survey. Existing survey may not show the existence or location of underground utilities that could affect the buyer’s plans for the property, such as installation of a sport court or expansion of the house. A new survey will disclose all of this information. May not have been intended for use in property transfer. For example, the survey may have been prepared only to locate one property line for installation of a fence or other appurtenance, or for construction of the house, and may not accurately reflect all the encumbrances or other features on the property. If the existing survey reveals problems such as evidence of unrecorded easements or encroachments, the time to face those problems and deal with them is before the contract is signed. Even if the seller’s agent does not have a survey, he or she might know about survey problems. For example, a neighbor may have built a fence or other structure that appears to cross over the boundary line. The lender will sometimes impose requirements for the survey that are more onerous than (or at least different than) those you have imposed on behalf of your buyer client. This is more likely to be the case in a large commercial transaction. The best approach in that situation is to initiate communication between you, the surveyor and the lender’s attorney as early as possible so all parties understand the scope of the surveyor’s work and are satisfied with it. As a buyer’s representative anticipate a typical lender may be involved in the transaction at some point, so you should try to anticipate a typical lender’s requirements when you order the survey.